Hasebe Kunishige (長谷部国重) has long been considered to be a pupil of Masamune (正宗) (Masamune Juttetsu). His oldest remaining dated work is dated Bunwa 4 (1355) and his latest is Kôan 1 (1368). Most of his dated works are from the Enbun era (1356-1361). Given the fact that his working dates appear to be somewhere around twenty years after Masamune (正宗), this connection can be considered to be somewhat dubious. There are also opinions that based on the surname Hasebe (長谷部), that his native place was Yamato (大和). However, Kôzan Oshigata and other authorized synopses list the name Hasebe (長谷部) as having been used also by Shintogo Kunimitsu (新籐五国光)and his sons, Kunishige (国重) and Kunihiro (国廣). This seems to indicate that the Shintôgo (新籐五)and the Hasebe (長谷部) were consanguineous. Therefore, it is not beyond the realm of possibility that it was the first generation Kunishige (Shintôgo Kunishige新籐五国重) who was the direct student of Masamune (正宗) since he belonged to the Shintôgo (新籐五)school that descended from the teachings of Shintôgo Kunimitsu (新籐五国光), one of Masamune’s (正宗) teachers. That theory would make more logical sense when we consider the working period of the smith we know as Hasebe Kunishige (長谷部国重). The relationship between Hasebe (長谷部) and Shintôgo (新籐五)has not been clarified definitely. It is obvious, however, that both groups bear strong Sôshû characteristics in both the ji and ha sections of their works. Hasebe Kunishige (長谷部国重) moved to Kyoto with his brother Nobukuni (信国)and continued to produce swords in the Sôshû (相州)style of sword making. This probably accounts for the fact that most references list Kunishige (国重) as a Yamashiro (山城) smith rather than a Yamato (大和) smith. I should like to point out, however, that while he produced swords in the Sôshû (相州)tradition, thus causing him to be listed among the Sôshû (相州)smiths, I have found no references to him taking up permanent residence in Kamakura or anywhere outside of Kyôto. In fact, recent research has disclosed that Kunishige (国重) probably originated in Yamato (大和), went to Kamakura (Sôshû 相州) to study sword making, and finally migrated to Kyôto to reside. For this reason, he should be considered to be a Yamashiro (山城) smith working in the Sôshû (相州) tradition. (国信), Kunihira (国平), Munenobu (宗信), Kunishige (国重), and others. These smiths were active from the Nanbokucho era through the early Muromachi era. SUGATA: Wakizashi and tanto are most common with tachi or katana being rare. Tachi were made in the shape of the Nanbokucho era and all are o-suriage today. In their original shape, they were well over three shaku in length having a modest sori. The overall width of the blade was on the wide side but with not too much hiraniku. The mune will be in iori-mune and the kissaki will be made very long without much roundness at the fukura. The tanto and hira-zukuri ko-wakizashi sugata will be slightly sun-nobi (about 31 cm) with modest sori (saki-sori) and thin kasane. Mitsu mune is usual but occasionally one with maru-mune will be found. JITETSU: Mostly a fine itame mixed with some mokume. There will be some masame hada mixed in, especially near the mune and within the hamon. This is an important kantei point as it separates the works of the Hasebe (長谷部) school from that of their contemporary Sôshû (相州)smiths such as Hiromitsu (廣光) and Akihiro (秋廣) who never have masame in their kitae. Chikei will be mixed in with strong ji-nie. Shirake utsuri will sometimes be found in the jitetsu. HAMON: Hitatsura is the most common, there is also ô-midareba, and rarely suguba. Tamayaki and mune yaki is frequent. His works will resemble those of the two very famous Sôshû (相州) smiths, Akihiro (秋廣) and Hiromitsu (廣光) with some important differences. The most important difference will be that Hiromitsu’s (廣光) and Akihiro’s (秋廣) hamon will always contain some chôji while the hamon of Kunishige (国重) and Kuninobu (国信)will be based upon notare/gunome without chôji. The hamon is of an irregular width, narrow and small patterned in the bottom area and wide and large patterned in the upper. Many tobiyaki and a hitatsura pattern is common. The characteristic of the tobiyaki of this smith is that the pattern inside the tobiyaki looks like vertical stripes because of the masame hada. The hamon consists of rough nie. Many sunagashi, kinsuji, inazuma, and clouds of nie can be seen. The hada will often be visible and will usually contain masame especially around the mune and in the hamon. BÔSHI: Midare-komi is the most common but on long swords ichimai will be found. In all cases, however, the kaeri will be deep. HORIMONO: Bo-hi will be common with the top of the hi descending and separate from the ko-shinogi. Ken, bonji, kuri-gata, kurikara, and rendai will often be found. NAKAGO: We have no original nakago for tachi but the nakago of tantô and wakizashi will be short and stubby. Tanago-bara is most common. The nakago mune will be rounded with the tip forming a gentle kurijiri. The yasurimei will be katte-sagari or kiri. MEI: The mei will be long and read Hasebe Kunishige (長谷部国重). The center of the character for “Kuni” (国) will be written as “Tama” (玉), thus he is known as “Tama Kunishige” (玉国重). Kuninobu ( 国信) is said to have been the younger brother of Kunishige (国重), and is also said to have been his son. Judging by the working dates of Kuninobu (国信), the younger brother scenario is more likely. His work closely resembles that of Kunishige (国重), but is slightly inferior. Indeed, sometimes it is very difficult to tell the workmanship apart between these two smiths. The dates given for Kuninobu (国信) blades are Bunna (1352-1356), Enbun (1356-1361), and Jôjî (1362-1368). Like Kunishige (国重), he produced mainly ko-wakizashi and tanto. We are, however, fortunate to have some ubu surviving tachi by Kuninobu (国信) including the meibutsu Kara-kashiwa. While the overall shape and style of works by Kuninobu (国信) closely resemble those of Kunishige (国重), there are a few minor differences. 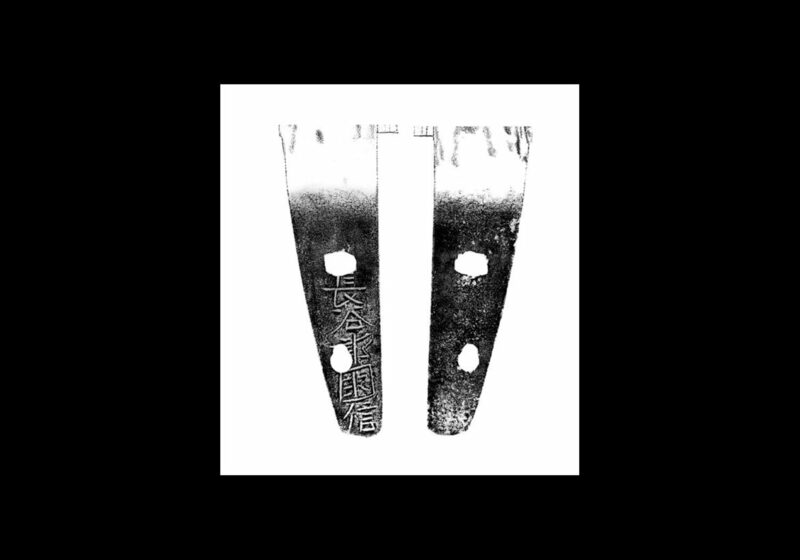 For one Kuninobu (国信) seems to have made blades in a greater variety of sizes than Kunishige (国重). For example, he made rather long tantô in lengths of one shaku three or four sun (about 40-24 cm) and short ones around seven sun (about 22 cm). His hamon will also be slightly larger and wider than that of Kunishige (国重) on occasion. Measurements: Length: 27.4 cent. ; Curvature: 0.25 cent. ; Width at Base: 2.7 cent. ; Nakago Length: 8.4 cent. ; Nakago Curvature: none. Characteristics: The construction is hira-zukuri with a mitsu-mune. The blade is wide and thin with slight curvature. The kitae is itame with a mixing in of flowing hada that is prominent and covered in ji-nie. The hamon is ko-notare mixed with gunome. There are repeated streaks of sunagashi, and the habuchi is covered in nie. There is a mixing in of tobiyaki, making the hamon become slightly hitatsura in style. The bôshi is midare-komi and slightly ô-maru with brushing and a long kaeri that is tempered far down the blade, becoming muneyaki. There is a bonji carved on the omote, and a kensaku (Buddhist rope typically carried by Fudômyôô) carved on the ura. The nakago is ubu, and the end is kurijiri. The yasurime are kattesagari, and there are two mekugi-ana. In the middle of the sashi-omote, extending down to the nakago-jiri is a large-sized, five-character signature. Explanation: Hasebe Kuninobu(長谷部国信) is said to be the son of first generation Kunishige (国重) however, because of the style of workmanship, it is believed that he was active at almost the same time as Kunishige (国重). This tantô has a notare mixed with gunome hamon that is slightly hitatsura with its mixing in of tobiyaki. The manner in which the signature is done also has features in common with Kunishige (国重), and it is a sword that clearly displays Kuninobu’s (国信) characteristics.